This aerial image shows a neighborhood that was destroyed by a wildfire in Santa Rosa, Calif., Oct. 10, 2017. That number will be $35 billion a year by 2050. Americans are already paying a hefty price for climate change — to the tune of billions of dollars a year. The costs of storms, floods, wildfires, and droughts have added up to $350 billion over the past 10 years, according to a new report from the Government Accountability Office. And that doesn’t include this year’s hurricanes and wildfires. Taxpayers are shouldering the burden of the costs, which will keep growing — potentially to $35 billion a year by 2050, according to the report. The US currently sets aside just $7 billion a year to deal with disasters. 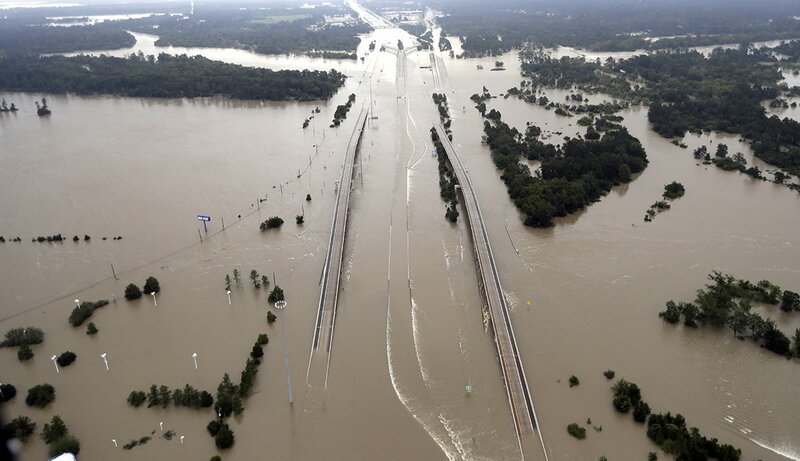 Interstate 69 is covered by floodwaters from Tropical Storm Harvey Tuesday, Aug. 29, 2017, in Humble, Texas. Two US senators from opposite sides of the political aisle requested the report: Sen. Susan Collins (R-ME) and Sen. Maria Cantwell (D-WA). The GAO, a nonpartisan watchdog office, looked at academic and government studies on climate change impacts, interviewed experts, and tallied the potential future cost of climate disasters. And the outlook isn’t good. The government has failed to plan financially for future disasters so much so that the country is considered as “high risk,” for financial exposure, according to the report. The cost of climate change has already been staggering: over the past decade, the US has spent $205 billion for domestic disaster response and relief, $90 billion for crop and flood insurance, $34 billion for wildland fire management, and $28 billion for maintenance and repairs to federal facilities and federally managed lands, infrastructure, and waterways, according to the report. 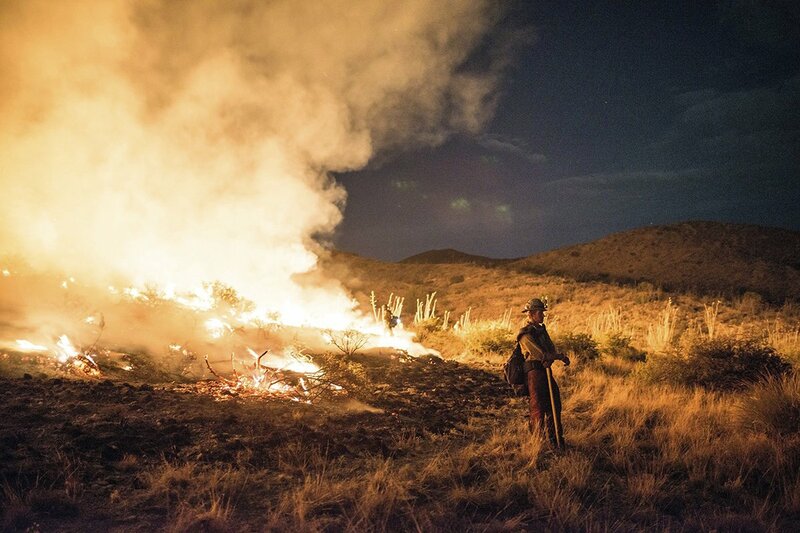 This photo provided by Wyoming Hot Shots, a member of the Wyoming Hot Shots firefighting crew pauses while battling the Lizard Fire near Willcox, Ariz., June 8, 2017. "This nonpartisan GAO report Senator Cantwell and I requested contains astonishing numbers about the consequences of climate change for our economy and for the federal budget in particular,” Collins said in a statement. While the report said regions will fare differently under climate change, Collins said Maine was already experiencing hardship. "In Maine, our economy is inextricably linked to the environment. We are experiencing a real change in the sea life, which has serious implications for the livelihoods of many people across our state, including those who work in our iconic lobster industry." The White House has not commented on the report, according to the AP. In recent months the Trump administration, including the Environmental Protection Agency, have withdrawn the US from the Paris climate accord, rolled back President Obama’s signature climate change plan, and removed the words “climate change” from websites. And while $35 billion a year is a significant amount of money, it is less than 1% of the total US budget. The government spends about $500 billion a year on defense. Global Citizen advocates for the implementation of the UN’s Sustainable Development Goals, including Goal 13, Climate Action. You can take action here.